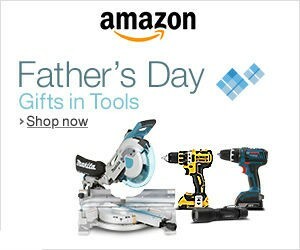 There are few times of the year where you can find bigger savings on power tools than the weeks leading up to Father’s Day, and this year is no different. Whether you are looking for a gift for your Father, or looking to get something for yourself, there are deals to be found by most of the major brands. Best of all, you can find these deals in the Father’s Day section of our Hot Deals Hub. Just to give you an idea of the deals that are currently available, over the weekend we added broad dollar-off deals from Bosch, Black & Decker, DeWalt, Makita, and Stanley. We also added specific tool deals from brands, like Milwaukee. Also, let’s not forget about our Lowe’s coupon codes, that can save you anywhere from 10% to 30% off your online order. Like I said, we already have a bunch of hot tool deals for Father’s Day, but we will continue to add more deals as we find them. If you spot a killer tool deal, you too can add it to the Hot Deals Hub, or you can send me an email.